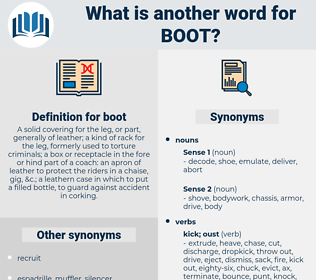 What is another word for boot? A solid covering for the leg, or part, generally of leather; a kind of rack for the leg, formerly used to torture criminals; a box or receptacle in the fore or hind part of a coach: an apron of leather to protect the riders in a chaise, gig, & c.; a leathern case in which to put a filled bottle, to guard against accident in corking. Institutes, cranking, initialisation, beginning, grubbing-up, initializer, shroud, outset. Began, Embarked, opened, Entered, broke, Commenced, startup. triggering, Commencing, Instigating, Instituting, Embarking, proceeding, entering, Resuming, Attempting, getting, cranking, beginning. Begun, Instituted, Undertaken, Embarked, opened. embarks, opens, cranks, turns, enters, engages, goes, fires. bootstrapping, initialization, inception, foot, startup, bootup, onset. engage, keep, welcome, employ, admit, hold, allow, take in, hire, permit. Without leaving his seat on the fence, the man said: " I'll trade for five dollars to boot." I always said I could black a boot better than you. half boot, riding boot, buskin, hip boot, combat boot, gum boot, top boot, wellington boot, wellington, jackboot, rubber boot, thigh boot, ski boot, desert boot, hessian, hessian boot, cowboy boot. casing, shell, footwear, footgear, case. counter, eyelet, toecap, spur, collar, bootleg, shoe collar, outsole, heel counter, Eyehole, toe box, gad, instep, innersole, upper, insole, bootlace, heel, tongue.